I loved writing this article for Web Designer Depot. I really do believe in this approach: When it comes to business, empower others and your openness will come back to you tenfold. Over the past few quarters especially, we’ve been practicing the “empowerment” mentality more and more – and have only seen growth. The negative side effects naysayers love to tout (you’ll run yourself out of business! no one will be interested in what you do if you show them how you do it!) have been absolutely nil, zip, zero, nada, etc. In some ways, I see our mentality of client empowerment as an outgrowth of a shine theory approach to life, which encourages women to support one another in a world that all too often insists that women are catty competitors. Perhaps this is because many of the clients we work with day in and day out are women (or, at least, our favorites are 😉). Of course, I believe an empowerment approach is the best approach for any client or customer. But I do feel passionate about connecting with women-owned businesses for mutual support, encouragement, and growth. What happens when you take the OPPOSITE approach to your client relationships? When you really, honestly are set out to chain clients to you ad infinitum? (With some BS excuse to justify it, of course). I wrote about that too. But in a publication that allows more, uh, ...vibrant tenacity? Rage. Rage. That's the word I’m looking for, here. Rage. Total outrage. Actually, that’s not what this piece ended up being called at all. Sometimes in life, you don’t get to make the rules for headlines’ appropriate levels of punchiness. Pretty much anytime in life, to be honest. Find the less dramatically titled “Face facts: You’re replaceable, and there’s only 2 things you can do about it” here. [But check out how that URL reads for the slightly more spicy title before it was toned down 😉 ]. Who’s ready for a nice chat on site builders? You know, the largely drag-and-drop, template-based website creators like Squarespace, Wix, Weebly, etc.? After writing about the missed opportunities Squarespace offers to small businesses and web designers alike on the Hoot Design Co. blog, we pitched the concept to Web Designer Depot to see if they’d be interested in running an article based on the same principles. They picked up the idea, and we narrowed down the scope to target web designers specifically. At the same time, we expanded the concept’s reach to include other site building platforms as well (not just Squarespace). Though Squarespace is my platform of choice thanks to its great mix of aesthetic customizability and an unchanging, user-friendly backend that clients – even technologically challenged ones – have no problem managing, the underlying principle of the article applies to other services as well. Unfortunately, we had to take out the article’s original He-Man gif before going live. Though I was worried, the article got a lively response. → You can check out the full article on Web Designer Depot here: Why every web designer should embrace site builders. → And give the original piece a read on the Hoot Design Co. blog here: Hey Squarespace Snobs: You’re Missing Out on Major Business. But I wanted to look at picture books in a different way: as a set of quantifiable data points. For someone happy to write a 25-page paper analyzing concepts like the intersection of art theory and social realism in Middlemarch, a data-driven analysis of children’s literature was definitely a departure from the norm. But the small data set from which articles on topics like trends in racial representation in children’s literature were able to draw bothered me. I wished there was some sort of standardized collection of data to writers and researchers could lean on in order to gauge change over time. Enter the Caldecott Medal, which has been awarded every year since 1938. Though the committee which chooses the winners states that the Caldecott is not awarded for “didactic intent or for popularity,” the title “most distinguished American picture book for children” certainly indicates a book that exemplifies national values. And even if winning a Caldecott isn’t intended to reflect nation-wide popularity, the award catapults these books into the national spotlight as well as the homes of many families. So I attempted to analyze the individual components of each Caldecott winning book from 1938-1975 as objectively as possible in my project Caldecott Stats. I wanted to to see if any trends in genre, morals, or representation came to light. There were some very clear trends I found, particularly in the type of stories that were being told. For example, there was a very clear, sharp increase in the number of fables or fairytales winning the Caldecott throughout the sixties and early seventies. However, analyzing the particulars of race, culture, and class status proved much more difficult than I initially hoped. The category (apart from genre) that proved the easiest to parse was gender. 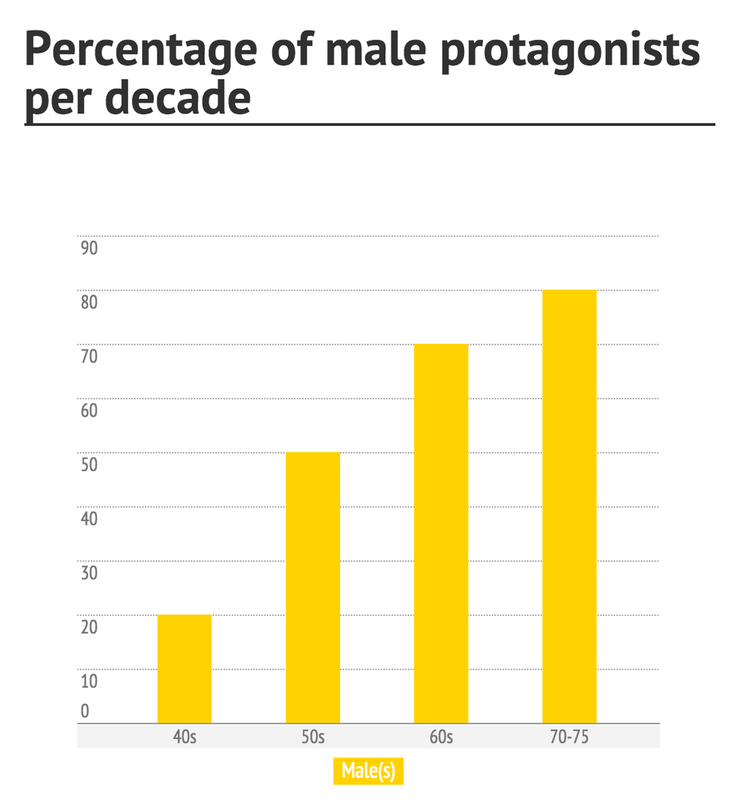 → The percentage of books centered on male protagonists steadily increased between 1938 and 1975. 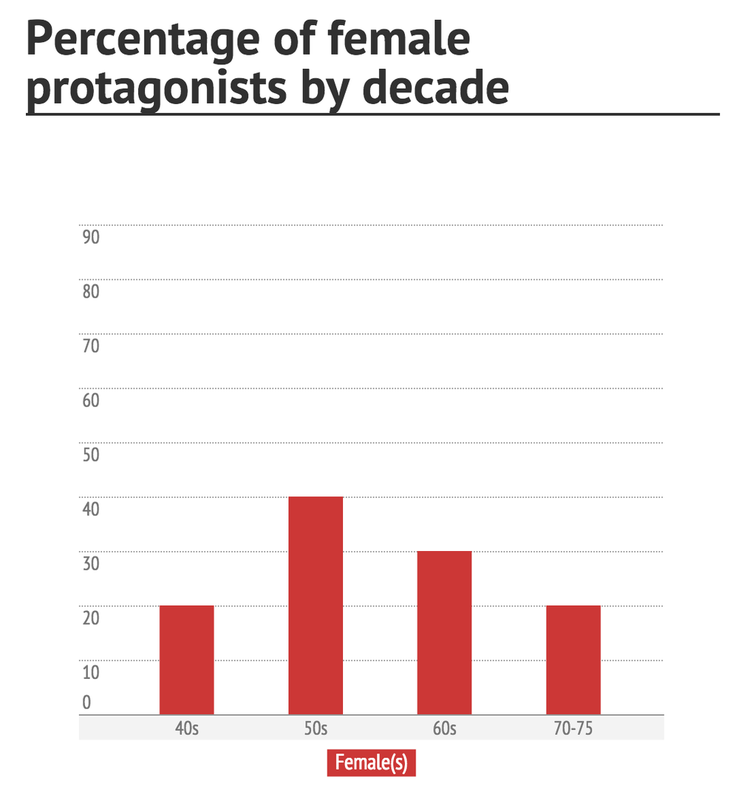 (The decade with the largest percent of female protagonists was, actually, the 1950s.) 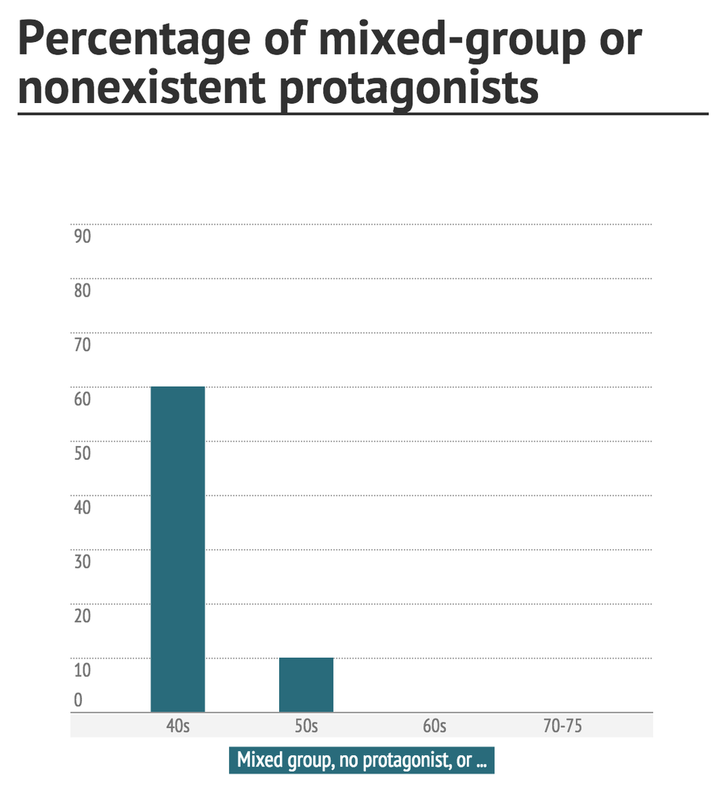 The representation of mixed-group protagonists or stories without a protagonist peaked in the 1940s and dropped off the map entirely after the 1950s. What was particularly surprising about the rise of the percentage of male protagonists per decade was that this trend corresponded with an increase in the percentage of female Caldecott winners per decade. Unfortunately, many areas of analysis are still missing from the current project website. I’m not sure when I will be able to devote time updating the project, but in the meantime you can check out the Caldecott Stats project in all its incomplete glory.